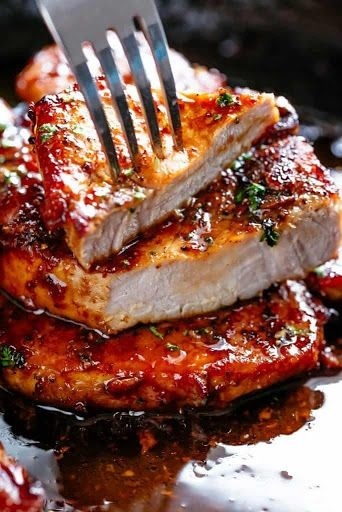 Easy Honey Garlic Pork Chops made simple, with the most amazing and addictive 4-ingredient honey garlic sauce that is so good you’ll want it on everything! Quick and easy to make, your new family favourite pork recipe is here! Preheat oven broiler (or grill) on medium-high heat. Season chops with salt, pepper and garlic powder just before cooking. Heat oil in a pan or skillet over medium high heat until hot. Sear chops on both sides until golden and cooked through (about 4-5 minutes each side). Transfer to a plate; set aside. Reduce heat to medium. Melt butter in the same pan, scraping up any browned bits from the bottom of the pan. Sauté garlic until fragrant (about 30 seconds). Add the honey, water and vinegar. Increase heat to medium-high and continue to cook until the sauce reduces down and thickens slightly (about 3-4 minutes), while stirring occasionally.